First of all Happy New Year =) Here's to 2010. It was a very very good year and I know 2011 will be fantastic!! CHEERS! Ok, so I was suppose to upload blog posts on my Peru and Bolivia trip but I'd rather savor the last hours of 2010. Actually, I've been procastinating for months now on doing this. I chose, to instead, make my own new year's meal from scratch (beef stew, rosemary bread, pomeberry tinis and apple crumble with madagascar vanilla ice cream). This is Mojo- not a shrunken Roxy =) It's the new pup in the block. My cousin is into baking and decorating cakes with fondant. Christmas eve at my aunt's...she went with fancy finger food. There wasn't a lot of cooking but the prep work was so tedious!!!!! We thought nobody was going to show up- thus the empty photos. The clan showed up finally and the stuffing of faces began. It was a chill night...my uncle put on netflix streaming and we watched a riveting documentary on dogs (which I've already seen). The young ones played rock band and I was so tired that I said goodbye to everyone, went to my room and slept. Roxy is sporting a cat Christmas ski cap that I got her from Target...she absolutely hated it. Christmas decor in our apartment...oh this is my first real Christmas tree ever. It's magical. Growing up in a tropical country we only had coconut trees...hehehe...ok actually we had fake overpriced trees made from China. I have recently been watching the Cooking Channel nonstop. I love how the shows are edgy and fresh. Everything is just damn good. One of my favorites would be Jaime Oliver's: Jaime does Christmas and Jaimie's Family Christmas. It's a rustic, quirky and hearty production. I love how he has different members of his family as his guests. Add Jaime's no frills approach to food and sense of humor- you will be glued.I think he's my foodie soulmate. I knew it as soon as I saw him show how awesome a combo of grappa, frozen grapes and chocolate are. I thought I was the only one experimenting on store bought food and/or drink combos. Ok I am a bit smitten by Jaime Oliver =) Who wouldn't be? Women love a good cook and with an accent to boot. Ha! Anyways, the channel has inspired me to start cook. I've dabbled here and there but I realize that it's now or never. I have to start getting serious about cooking. I, after all, come from a family of good cooks. Most especially, my Lola Nena who hands down is one of the best cooks I've ever known in my life. Below are a couple of dishes I made. This is my pride and joy. 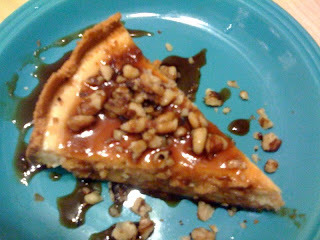 It's my queso de bola cheesecake with muscavado sauce. In the Philippines it's traditional to have a ball of cheese on the Christmas dining table. This usually goes with Chinese ham, grapes or grated on top of fresh buns of ensaymada. It's the perfect Nochebuena accompaniment. Note: QDB Queso De Bola is just edam cheese. 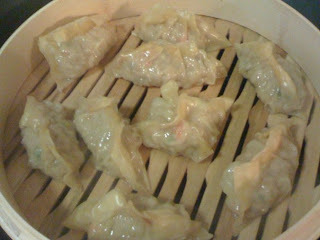 Siomai- to make it Filipino style serve it with rice and a side of toyomansi (soy sauce with lemon juice). 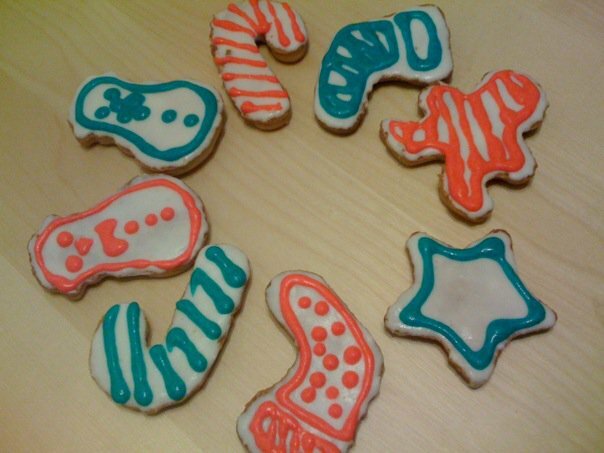 When I was young, my mom used to make this at home. I was always fascinated by the way she was able to daintily wrap this delightful mixture of minced shrimp, pork, carrots and green onions. The key is to buy your ingredients fresh from your local Asian store. For the wonton or siomai wrappers, avoid getting the ones in the freezer- gross. The wrappers also come with a simoai/wonton recipe which I actually ripped off for this one. The bamboo steamer came from World Market (just place it on a wok with boiling water for 10-15 minutes). You can also steam some bok choy leaves and mushrooms to serve as side dishes. This is a pho/wonton soup hybrid. You can choose to use leftover wonton/siomai or thin slices of beef round eye. 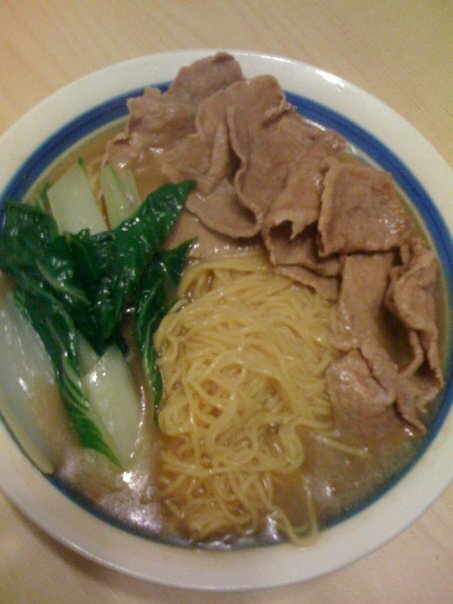 Boil the wonton noodles separately because they are covered in starch that will cause your broth to become thick. You don't want that to happen. To assemble, place blanched bok choy leaves and cooked noodles in a bowl. 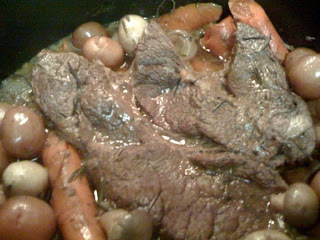 Then place the beef slices on the side and pour boiling beef broth in the bowl. This will cook the beef. You can also choose to precook the beef. To do this, quickly dip the thin slice of beef in boiling water. You want it to be soft and not overcooked. Ah, the classic pot roast. Awesome for a rainy California wintery-ish Sunday. I was inspired by The Pioneer Woman's Perfect Pot Roast. In fact, I just finished cooking this baby an hour ago and it went down really good with a glass of cheap wine. I made sure to put lots of veggies- I never seem to eat enough of this. God, it was so tasty and tender it took all of my self control not to gobble the whole pot up. This is my aunt's thanksgiving seafood paella. 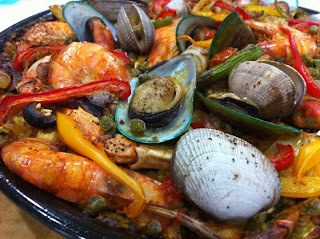 As you may well know, the Filipino culture has a heavy Spanish influence. And as Filipinos living in America we always have to incorporate rice in our holiday cooking. This recipe makes for a very festive rice. It's surprisingly super good with turkey. We serve this instead of stuffing. It's just a mixture of yellow and white rice, clam juice, saffron and any seafood that you can fit in the pan. World Market sells a paella kit for $20 so all you need to buy is the meat. 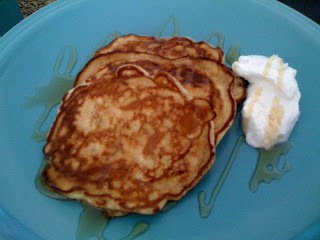 This is Jamie Oliver's homemade pear pancake recipe. It is soooooo easy and soooo good even his kids can make it. If you don't have self-rising flour just add 1 1/2 tsps of baking soda to 1 cup of flour and a pinch of salt. As for yogurt, I am going to suggest the nice and thick greek style yogurt. For the pear, the red d'anjou's are in season so make the most of it. 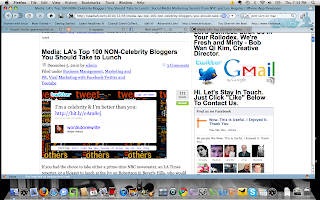 12/16/2010 07:28:00 PM | Labels: LA, Los Angeles, top 100 bloggers, what? 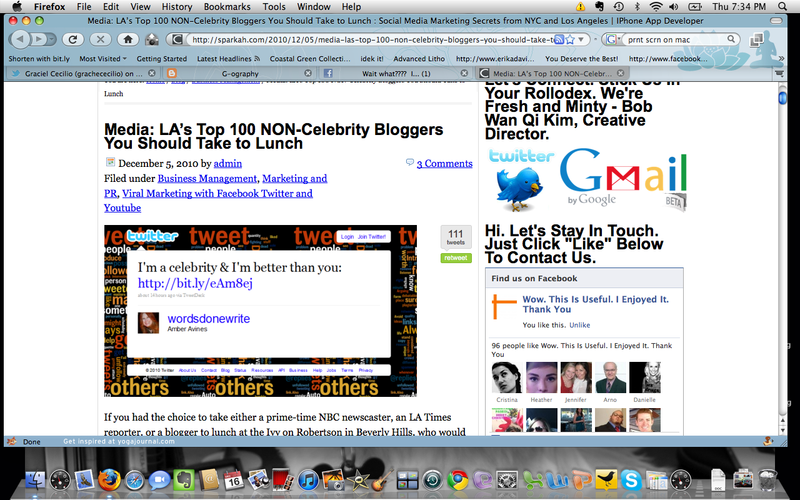 Print Screening it = framing it. By the way, I would really love for you guys to leave a comment. I know you are out there lurk...errrr....reading. Send me some cyber love. Now this may come natural to some but I'm not one of those people who would do rolls and flips when they were a kid- and for fun. I hate falling! So when my partner caught up to me and gave me a shove. Boy was I not ready. I ended with half of my face kissing the muddy ground. I turned around to my partner (chunky white guy) and I knew as soon as I looked at him I had mud smeared on half of my face. He did not even try to hide his laugh. Sorry, I know it's cut off but there were no options for a smaller frame so just watch it on YouTube.